This is the AquaCraft Revolt 30 FE Mono 2.4GHz. The AquaCraft Revolt 30 looks fast, even when its just on display! 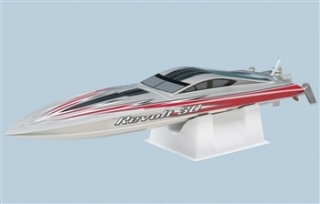 The AquaCraft Revolt 30 has a sleek, mono hull design profile that easily slices through the water, tons of high-performance genuine GrimRacer parts and a brushless power system.